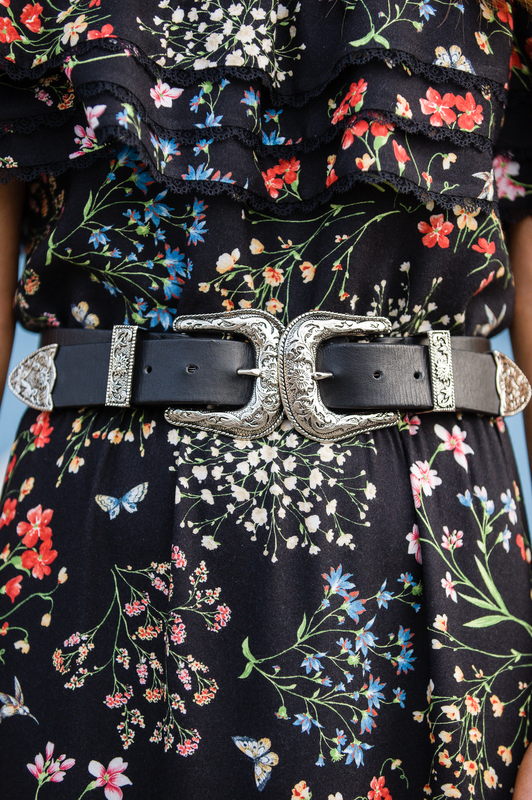 I love, love a dark floral. Something about it is so Spanish and romantic, right? 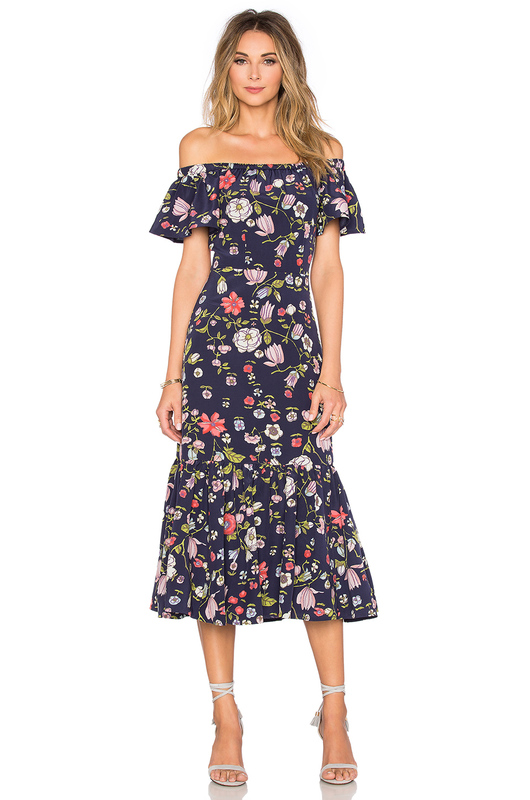 I also (obviously) love love an off the shoulder (anything), so I was all about this fab Alice & Olivia creation when I saw it at Saks in South Coast Plaza. The frilly detailing along the top and the sheer lace along the hemline give this dress such personality. It came with a self tie belt, but I am all about changing out to your own. This B Low the Belt creation is my life lately. With my favorite high waisted jeans for date night and over billowy tops…it just spices up any look. I knew it would give this otherwise super feminine dress an Western edge (which I love). 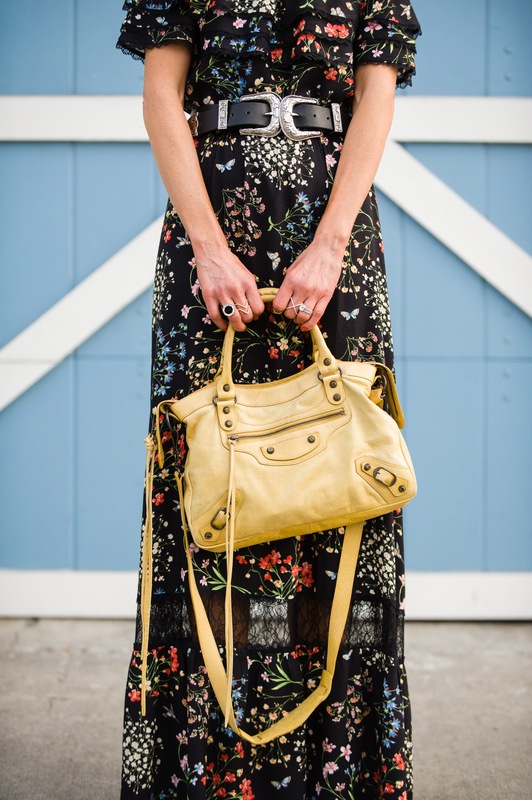 To make this look even more fun, I went with my yellow Balenciaga (color no longer available, but here is the exact size/style). How fab is this color? I have used this little gem nonstop since getting it years ago. A fab size with the must have crossbody strap. My sunnies, the usual Illesteva’s, were the perfect last touch to this look. Just that last little tinge of fun. I look forward to wearing this loveliness over + over again! 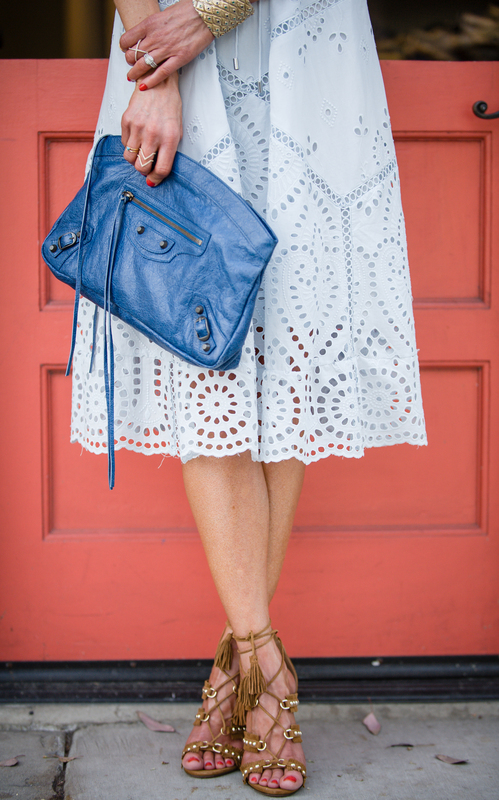 Eyelet detailing is another forever trend that is always chic and so easy to wear. It is the epitome of all things warm, right? I feel like you usually see eyelet in bright whites, so when I found this insane Zimmerman dress in cool blue, I had to have it. I adore the high neck and elaborate detailing of this fab creation. The cutouts and midi length make it uber chic and so on trend. 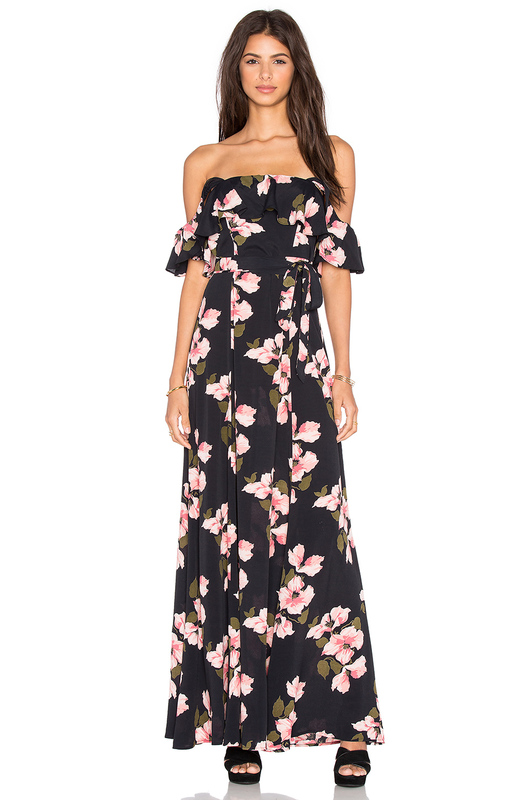 I feel like I will be able to wear this dress for seasons to come, which I love. To ease the sweetness of the look, I went with my lace up Aquazzara heels to add a bit of edge. I totally die over the cognac color, the grommet detailing and the tassles. The chunky heel makes these beyond comfy! So obsessed. Because this look is so girly, I grabbed my most feminine sunnies, my tortoise Super Duper Karen Walkers. They literally take up half of my face, which I am totally fine with! I also went with my fave House of Harlow cuff (I know I wear it all the time, but c’mon it’s too fab not to). Let me start with, I am always and forever about any kind of fun embellishment on clothing. I love that it’s basically built in jewelry for your outfit. This Raga skirt is all of that with the mix of beading and studs. For this particular look, I paired it with a night out appropriate top from Stone Cold Fox, but I will so be wearing it all Spring + Summer long with a simple tee and flops or a chambray and a fun ankle wrap sandal. Again with the lace up top because I just couldn’t say no to this bell-sleeved beauty. Sometimes a black top can be blah, but I love that this one has so much personality. 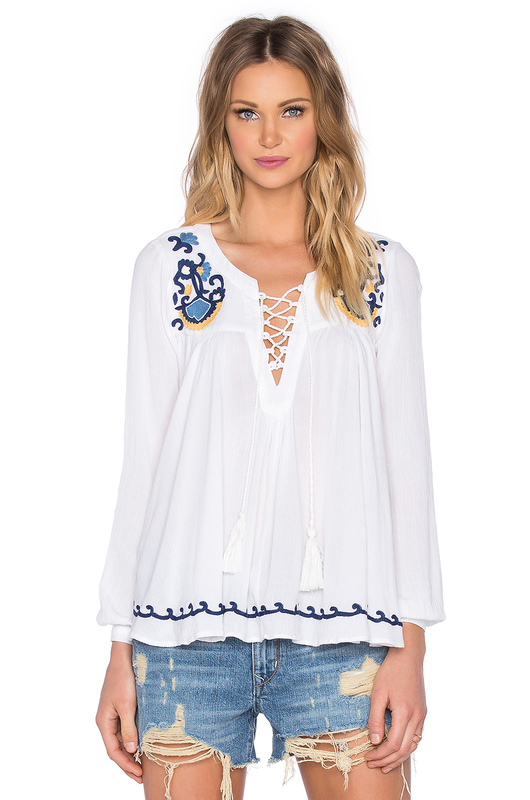 The mix of super boho sleeves and the trendy lace up, makes it a totally fab piece to add to your closet. It would be so cute tucked into any of the fun high waisted jeans that are everywhere. Now let’s discuss these shoes because I am totally in love love. I found them at Maje at South Coast Plaza and have been wearing them nonstop since. I love that the clog wooden heel is so in right now as it’s totally comfy and a total leg lengthener. I went with my Stella McCartney go-to clutch as the chain embellishment coordinated perfectly with the studs on the skirt. For sunnies, I grabbed my “Super Duper” Karen Walkers , an all time fave because they are so oversized. I can’t wait to wear this skirt over and over again! I love finding pieces like this that are easy to throw on and that can be worn in a variety of ways. Every year around this time I start to get the itch for all things white. Something about the first signs of Spring that makes me yearn for crisp, clean whites. I usually go with a LWD (little white dress), but when I saw this Line & Dot skirt I had to take the LWS plunge. The lace detailing plus the frilly silk hemline make it so beyond feminine and fun. It is everything and will 100% be in nonstop rotation all Spring + Summer. I initially got this frilly Mara Hoffman cropped top to pair with a high waisted denim short, but when it arrived I immediately thought it would be so fun with the skirt. The blue and white stripes and girlie ruffle style weirdly go well with the lace + silk of the skirt. Since both the top and the skirt have so much going on, I went with my most neutral tan shoe from Steve Madden. I adore these heels! They are so comfy and perfectly on trend with the thicker heel + platform style. I also chose my YSL (seems basically vintage now that it’s from pre Saint Laurent days) tan clutch. I love how simple it is, yet it is big enough for all my necessities. I felt like this look kinda had a 70’s vibe going on, so I paired it with my fave retro feeling Chloe sunnies. I love that really round, oversized glasses are in again! I added these Lizzie Fortunato earrings and my go-to Michele watch, my Alexander McQueen wrap bracelet and this fab double V Natalie B ring to finish off the look. I love love the flirty feel of this look. Date night ready times ten, right? So excited to wine + dine with my husband this weekend at our new favorite spot, North Italia. If you live in OC, it’s a must try. Pizzas, pastas, yummy salads and great fish too. The atmosphere is open and lively, which I love! Let’s just be real for a minute. I love dressing up and being girlie, but day to day, I am ALL about a quick, simple pair of cutoffs. We have been having the most insanely perfect weather here in SoCal (usually it’s a bit cooler here in February, but we have been spoiled with nonstop 80 degree days), making it hard for me to want to throw on anything other than these fab shorts. Let’s start with my current favorite cutoffs from Lovers and Friends. They are a bit higher waisted, which I love, and distressed in all the right places. I am so happy with this higher waisted trend, it’s perfect for a quick front tuck (which I think is always flattering). Now onto the top. I went through the plaid Rails + cutoffs obsession last year, but lately I have been all about the fun laced up detailing instead. I found this L’Academie one strolling on Revolve Clothing one morning and was instantly sold on the fun stripes and pockets. It would be so cute paired with a skirt or high waisted jeans too. My favorite (kinda badass) Valentino studded flats and my sherbet orange Balenciaga were the perfect additions to this easy look. Since the top + shorts are both pretty simple, I felt like my shoes and bag should definitely have some personality. I also threw on my go-to Michele watch, a wrap bracelet from Alexander McQueen and a matching studded bracelet from Valentino. For rings, I chose this Natalie B double v creation that I just snagged last week (I am obsessed). I finished the look with these new Illesteva sunnies that I found at Bloomies Fashion Island (my go-to spot for all things new and fresh in the world of sunnies).